By nature fly fisherman are purists and we understand this, so we never use live bait to chum fish and then have you cast to them. We feel that this practice is unethical and violates the “fair chase” ethic is an integral part of the sport of fly fishing. We work very hard to make sure that you are casting to high percentage areas that we know hold active fish. 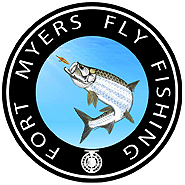 Listed below is a brief description of our Fort Myers fly fishing charters so that you can quickly identify the charter that best fits the type of fly fishing you would you like to do. As life long fly fishermen we understand the challenges and the satisfaction that comes from a successful day on the water. Unlike conventional tackle where it’s easy to cover a lot of water quickly, fly fishing is a finesse presentation and we realize that there is a limit to the number of casts you can make in a day. Our goal is to give our fly fishing clients the best odds of catching fish on any given cast. You can count on Capt Eric Anderson, your Fort Myers fly fishing guide to help you get the most out of every cast and every hour of your Fort Myers Fly fishing charter. One of the most important things to consider when booking a Ft Myers Fly Fishing Charter is the boat you will be fishing from. Our new BlueWater Flats boat has more front and rear deck space than any other boat in its class, we want you to have plenty of room to cast without feeling crowded. In addition every effort went into providing a fly line friendly deck so clearing your line is easy when that big Tarpon takes your fly. If you have never had the chance to go fly fishing at night, you’re in for a pleasant surprise. This is our most popular Fort Myers fly fishing charter for many reasons, the most important is that you will be able to see literally hundreds of fish and watched them chase and hit your fly. There’s nothing quite like it and after you’ve experienced it once you’ll want to go again. Many of our clients tell us it’s the most fun they’ve ever had fly fishing, and being able to see some really big fish is definitely an added bonus. The vast majority of our clients want to catch a Tarpon on their fly rod. We know that the catching is more important than the fishing. So we our efforts on the resident Tarpon in the waters we fish in and around Fort Myers. These fish range in size from 20 to 70 pounds, and fly fishing is the best way to catch them! This fly fishing charter focuses on Snook, but it is truly a multi-species fishing charter. We build this charter around the kind of fish you’d like to catch on your fly rod. In addition to Snook we try to target as many different species of fish as we can. On a typical Ft Myers fly fishing charter in addition to Snook you have a good chance to catch spec trout, redfish, ladyfish, and a wide variety of others.